I wake up to a neigh. I’m in a beautiful tent amidst the desert. I hear a horse gallop past my tent. “Ghoda chut gaya. Pakdo! !” yells one of the sowars. I feel like I’ve gone back in time. I step out of my tent and I’m greeted by a wonderful sunrise. The Dundlod flag flutters in the breeze as dawn breaks. Today is my first day with the Dundlod cavalry. 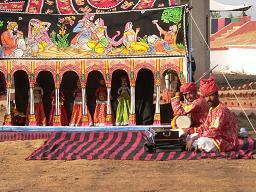 Dundlod is a small town in the Shekhawati region of Rajasthan. 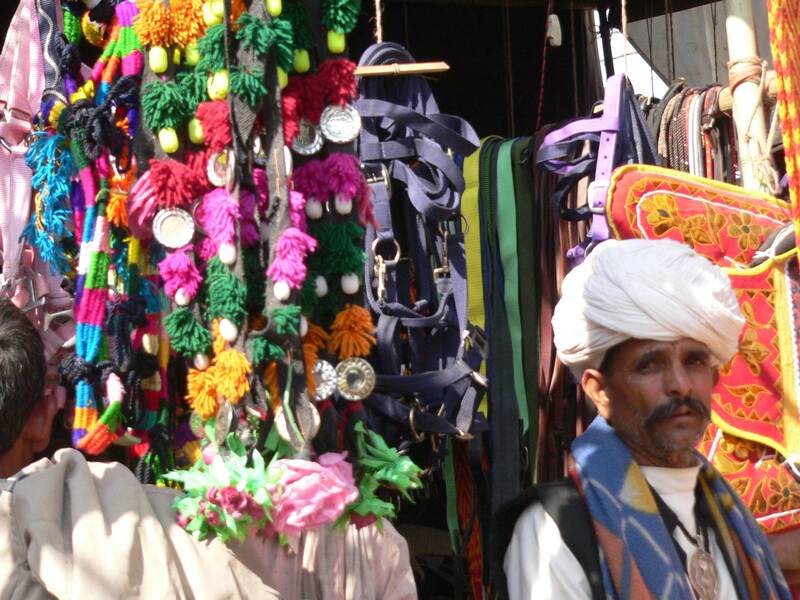 The Dundlod horses have traveled over a hundred kilometers to reach Pushkar. 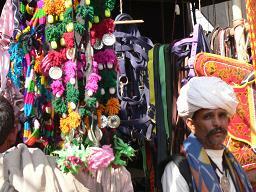 The Pushkar fair is one of India’s biggest cattle fairs. People travel from all over the world to the holy town of Pushkar every year. 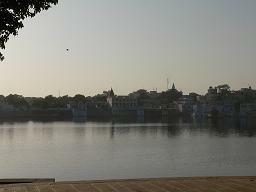 Pushkar is home to the only temple of Brahma(the Creator) in the world. Pilgrims have come to pay their respect to Brahma and to bathe in the Pushkar Lake on a full moon night, which is considered auspicious. 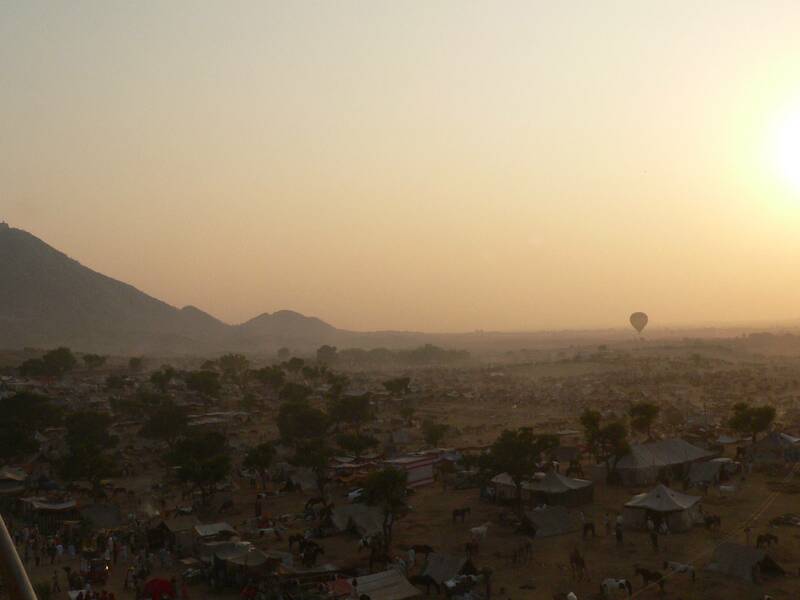 As the full moon night draws close, the number of people at Pushkar swells and so do the number of horses. I have breakfast with a gentleman who is one of the founders of the Indigenous Horse Society of India(IHSI). Today, Kr. 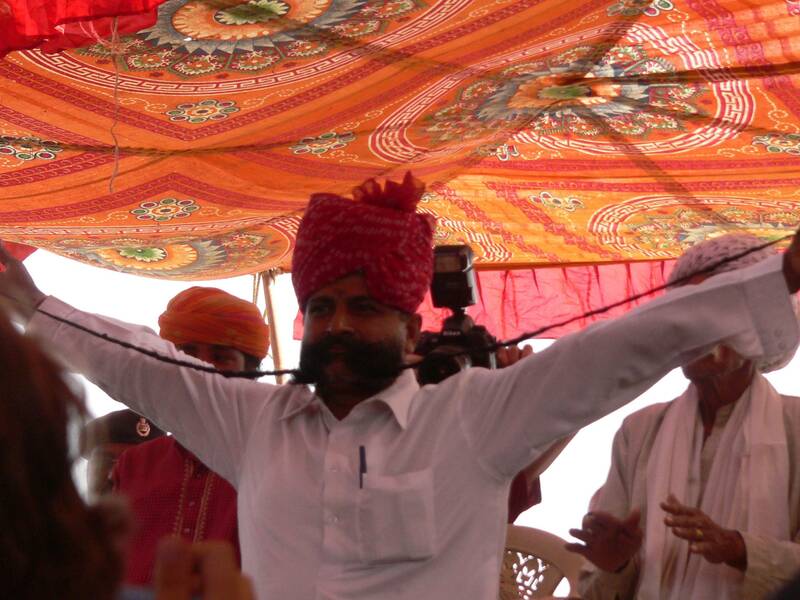 Raghuvendra Singh Shekhawat of Dundlod or Bonnie Singh as he his popularly known, owns some of the finest Marwari blood lines. The indigenious horse society of India has worked tirelessly to educate the people about the indigenous breeds in India. The Dundlod horses have distinguished themselves in equestrian sports like endurance riding. The Royal Equestrian and Polo Centre at Dundlod is famous for its dancing horses. Every direction I look, I see horses. I’m told there are around three thousand horses in Pushkar today and I can’t wait to go see them. Over the past few years I have met many riders over the net. This year we decide to meet up. Among the many riders, two young riders from Jodhpur, Gaurav and Sandeep are my guides for the day. 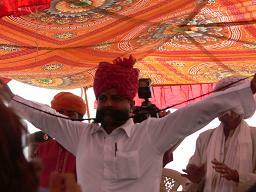 It is interesting to interact with the villages. They have their own ideas about training horses. I don’t agree with some of their methods, albeit its fun exchanging ideas. 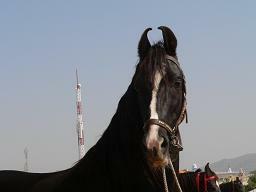 In India, some horses are considered auspicious based on their markings Gaurav explained the ‘lucky markings’ on a horse. Now, I was frantically searching for the luckiest horse!! And then I saw him. Being led through the crowded street was this huge jet black stallion. People gather around him and try to take a few photographs. The stallion is pretty much of a celebrity and I felt like a part of the paparazzi. The horse’s handlers swiftly lead him away and the stallion disappears into the crowd, as I stand there and admire him. Later during the day, I find the stallion’s camp. He has a tent to himself and a whole lot of people waiting on him. 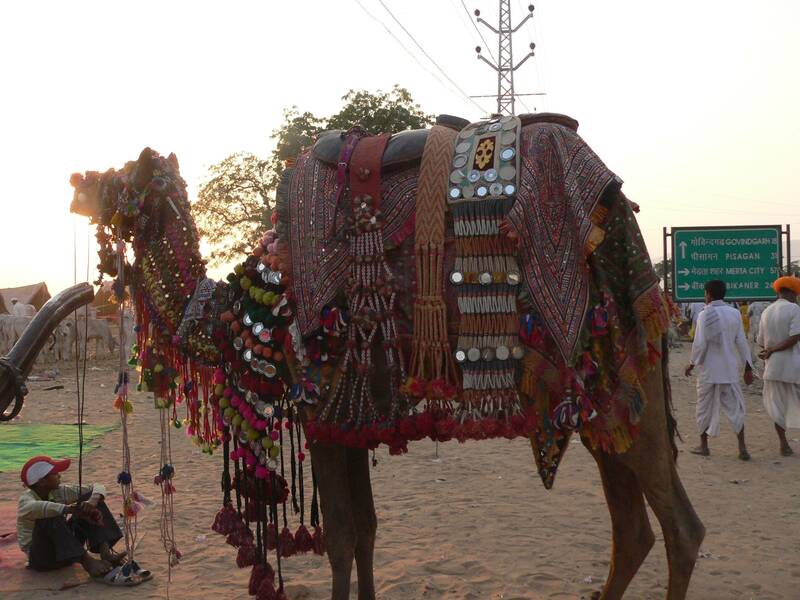 He is indeed the king of all the horses in Pushkar. 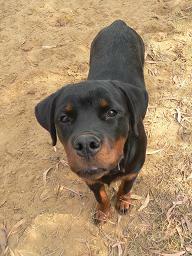 If I owned him, I’d have called him ‘His Highness’. His Highness has five white markings, also known as ‘Panch Kalyan’, which is very auspicious. Later that evening, we get together for a cocktail party. We sat there under the stars, besides a bonfire and horses dominated the topic of discussion. I got the news that ‘His Highness’ had been sold for an exorbitant price. Little did I realize how time flies. It was past midnight and the fire died, but not our spirits. We hadn’t finished our discussions as yet. Early the next morning, we galloped our horses across the desert. 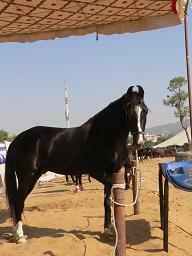 The Marwari horse is hot blooded and always ready to charge. 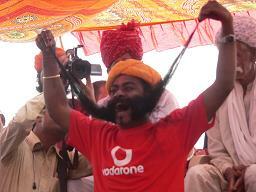 I love the spirit of the Marwari. I loved the gallop. All the horse needs is a signal and it’s off like a bullet. All our horses were racing and it felt like we were a group of bandits going to war. It’s difficult to slow down a galloping Marwari. Every horse wants to be the first…at least by a nose. We pass many small villages. We walk our horses through these villages. Children on their way to school wave us goodbye. Women gather at the well to collect water. Men on their way show us the path when we get lost. 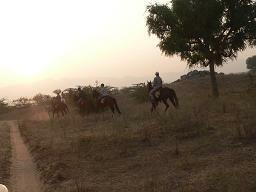 My fellow riders get a feeling of rural India. On our way we see peacocks, hoopoes and a variety of other birds, I’ve seldom seen before. One of the riders rides up to me and asks me about these birds. How am I to know about birds? After all, the little bird watching experience I have is confined to the college. I spend the rest of the day interacting with horsemen. I stumble across this street, which sells riding equipments, and I feel like a kid in a candy store. 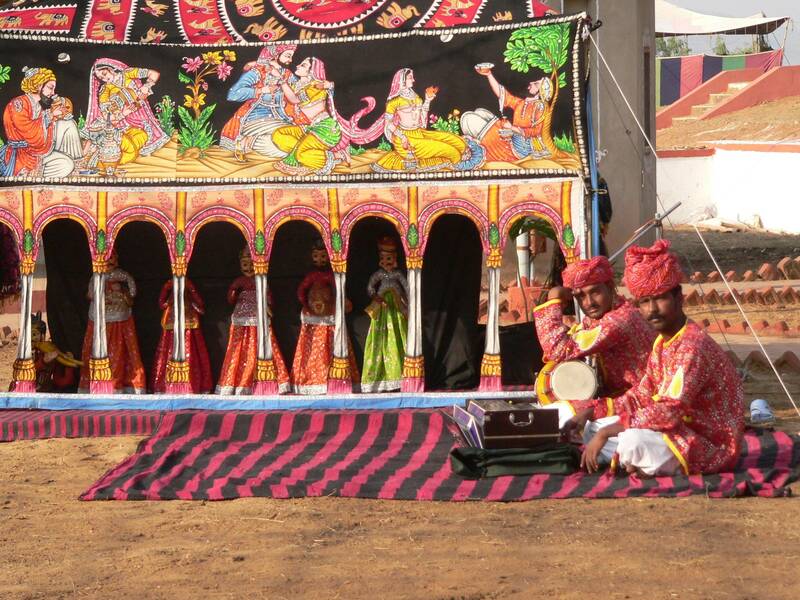 I stop by a group of Rajasthani musicians and listen to them for a while. I like the puppet shows they put up. I also met Ms. Francesca Kelly or ‘the Ghodiwali’ as she is known in this part of the country. She has promoted the Marwari breed in the United States and the Marwari is now performing at horse shows in France, thanks to her. Ms. Kelly has also gifted some of her horses to the Kentucky Horse Park. This evening I’ll get a chance to watch her latest documentary on Marwari horses. Apart from horses, I learnt a lot about camels. The most important thing- they bite!! And let me not forget to mention the 'mustache competition', some of these guys turned up with six feet long mustaches! !..It's a whole lot fun. A bit of a Vodafone commercial there, I must say..
After the end of a long tiring but interesting day, I climb up the highest place I could find, to get a wonderful view of the golden sunset. I’ve always loved sunsets. I see a hot air balloon sailing gently across the maiden. I get a wonderful view of the cattle fair. I sit there alone with my thoughts and I think to myself…what a wonderful world. Col. Sandeep Dewan and his men are at work training some fine show jumpers at the Silver Spurs Equestrian Stables. I sip my tea as I watch the horses being schooled. I have a Great Dane, a Rottweiler and an Irish setter for company. I ride a stallion named ‘Someday’. ‘Someday’ also happens to be from Mumbai. 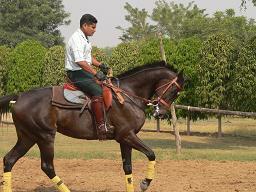 After riding the Marwaris, it feels great to be astride a thoroughbred stallion. After my riding session, Col. Dewan and I head off to the 61st Cavalry. Col. Dewan explained the history of the 61st Cavalry. After independence, the princely states became a part of India. In 1953, their Cavalries were reorganized into a single regiment which is called the 61 Cavalry today. The Gwalior Lancers, Jodhpur / Kachhawa Horse, Mysore Lancers, Patiala Lancers and Saurashtra Horses Cavalry Squadron made up the 61st Cavalry. As we drive around the campus, I’m awe struck. It’s the most beautiful place I’ve seen. The lush green polo grounds, the cross country course, the dressage arena are spectacular. We stop at the Polo Lounge. Its one place I can spend hours at. 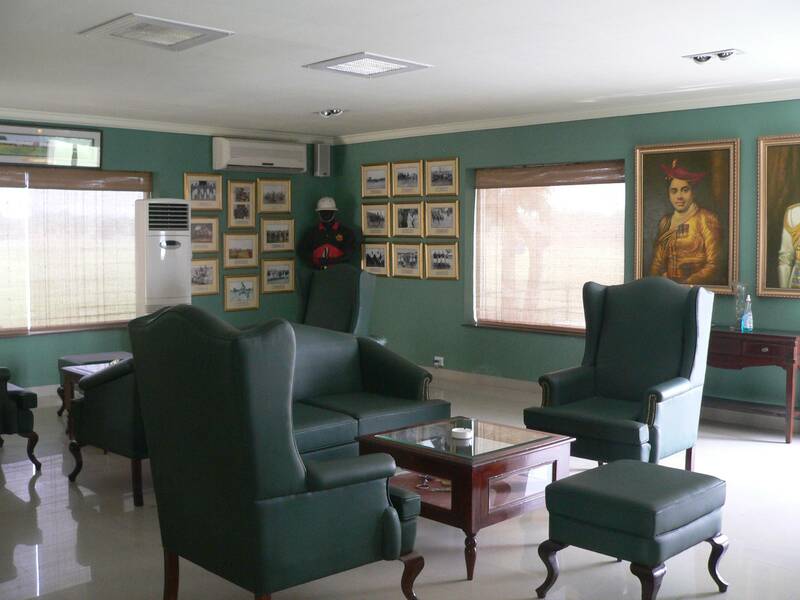 I’m lost gazing at the countless photographs on the walls, which tells the story of polo in India over the years. The bar is impressive and has saddles for bar stools. A brass band is practicing on the lawns outside. This place is definitely a horse lover’s paradise. We move on to the stables. There are over two hundred horses here. Thoroughbreds, Hanoverians, Haflingers, Polo ponies from Argentina…so many different breeds!! The Cavalry has participated in various ceremonial occasions like the Edinburgh Military Tattoo, the Shimla Military Tattoo and the most ceremonious occasion of British history, ‘All the Queens Horses’ in May 2002. I sit and chat with Col. Tarun Sirohi. I don’t want to leave this place. The 61st Cavalry is indeed a symbol of valour, splendor and excellence in equestrian sports. South Avenue in New Delhi is home to the Indian Cavalry Memorial. The memorial is called the Teen Murti Memorial and consists of three sowars representing the Hyderabad, Mysore and Jodhpur lancers that made up the original brigade. I just missed the Cavalry weekend parade, although I got a glimpse of the end. I visited the 61st Cavalry unit in Delhi. Maj. Ravi Rathore showed me around the campus. I missed the opportunity to visit the President’s Bodyguard in Delhi. It’s another ceremonial regiment of the armed forces. Maybe the next time I’m in Delhi I’ll visit them. I haven’t got enough. I’ll be back for the International Show Jumping Event happening few months from now. In the mean time let me go and prepare…Thanks for reading! !